The Husky Energy refinery in Superior burns Thursday afternoon. Fires were out Friday morning at a Superior oil refinery that was rocked by explosions and consumed by fires most of the day Thursday. The blaze prompted county and local officials to declare a state of emergency and order evacuations that remained in place until 6 a.m. Friday morning. Several people were sent to nearby hospitals. 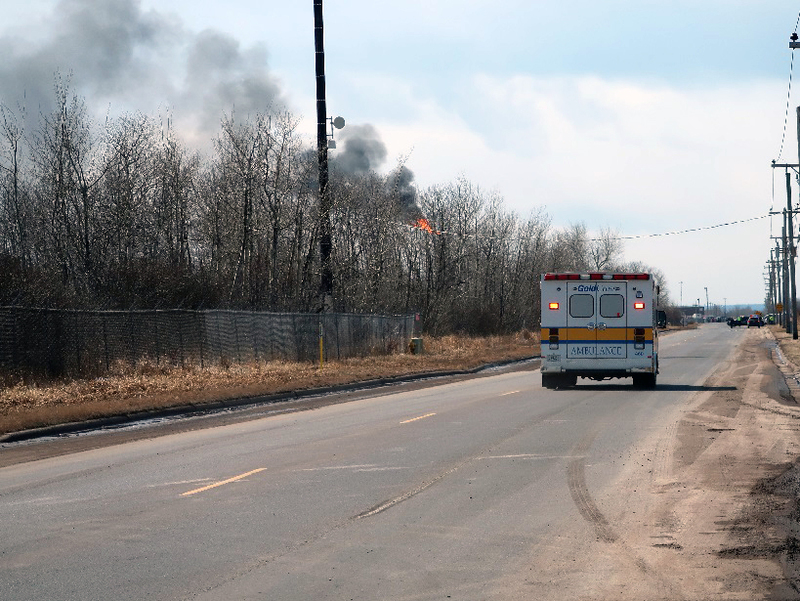 As black clouds billowed from the refinery, fire crews were involved in a seesaw battle with the fires since the first one broke out at the Husky Energy refinery on Thursday morning. That fire was largely contained, but reignited around noon, prompting Douglas County Emergency Management officials to order evacuations later Thursday afternoon. They continued to expand the evacuation zone as the day went on. Superior city officials eventually declared a state of emergency. At least 11 people were hurt in an explosion at the refinery Thursday morning, one seriously. In the early evening, Superior Mayor Jim Paine said that the fire at the smoky refinery had been put out, but that the evacuation order would remain in effect. He warned the fires could reignite again. Those concerns were later realized when Superior Fire Battalion Chief Scott Gordon said at a 9 p.m. news conference that a fire restarted but was contained. He said it wasn't surprising to have a secondary fire break out since it's very common when there's that much heat. "It's a relatively small fire. It's a flammable liquid that they can't get the valve shut off simply put. They've isolated it so there's very minimal risk that the fire's going to get any bigger and go any further. That's why we still have crews on scene. We have fresh crews here getting ready to replace the crews that have been there all day," Gordon said. He said that fire was being allowed to burn. Officials reiterated that a state of emergency and evacuation orders remain in place until crews are confident they can lift that. Husky Energy Refinery manager Kollin Schade said the exact cause of the fire remains unknown. However, Superior Fire Chief Steve Panger said earlier in the day they had received reports of a small tank explosion containing asphalt or crude oil. Schade said he isn't disputing or confirm any prior reports. "We need to do a complete evaluation of the facility itself. That task will start tomorrow," he said. Reports of an explosion from a tank containing asphalt or crude oil came in Thursday morning. Earlier Thursday, Panger said there were reports of multiple casualties and at least five people were taken to a nearby hospital. However, he said there were no fatalities. There was no immediate report on the severity of the injuries. Earlier in the evening, Schade said public safety has been the concern of the refinery all along. "There are hazards at the refinery, not only with the asphalt but other constituents that we need to take particular precautions around," he said. "Certainly, we have designed engineering standards in place to mitigate any concerns." Schade said they'll begin working with all the regulatory agencies to understand what happened at the refinery. Schade said they had water curtains engineered to protect workers and the public during such an incident. "It has worked flawlessly until this point, so we're very happy with that," said Schade. "That's why they're engineered and that's why they're specifically in place for disasters like this." Gordon said fire crews isolated the tank containing hydrofluoric acid and used foam to fight the blaze. Paine said they're still concerned about air quality and any release of hydrofluoric acid, a strong inorganic acid used mainly for industrial purposes but can cause serious health effects in people exposed to the chemical, according to the Centers for Disease Control and Prevention. "In the event that they were, we did have the resources necessary to treat any and all victims. There's also the risk of being in the smoke plume. If you're in the smoke plume, there is at least some health risk," said Paine. "We're working with (Occupational Safety and Health Administration) and the (U.S. Environmental Protection Agency) to determine exactly what that health risk is. As soon as we have that statement, we will release it. However, you do not want to be in the path of the smoke. You want to be clear of the smoke." Earlier in the day, Schade said agencies were on site working a plan to conduct air monitoring to ensure the air is safe. Douglas County Board chairman Mark Liebaert said he believed the EPA was one of those agencies. The Associated Press reported that a four-person team from the U.S. Chemical Safety Board would investigate. The board makes safety recommendations after serious chemical incidents. While crews battled the fires, city and county officials took steps to evacuate city residents Thursday afternoon. Staff at the refinery evacuated the area and Superior School District schools were evacuated and all after-school activities were canceled, according to the school district's Facebook page. The University of Wisconsin-Superior began evacuating campus shortly after 4 p.m. and planned to take students to the College of St. Scholastica in Duluth to stay overnight. The university had also canceled Thursday night and Friday classes, and extracurricular activities. 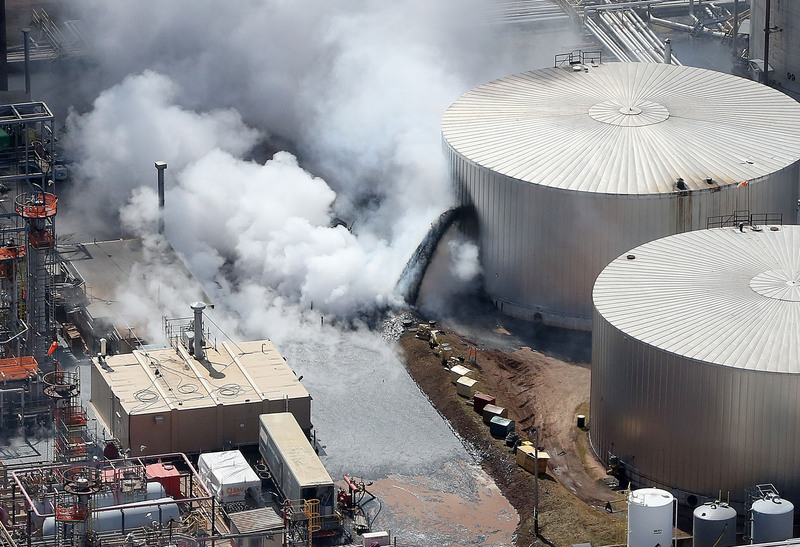 "We’re evacuating because there's a tank of product there that if it ruptures, it could create a plume that could be hazardous to one's health," said Douglas County Emergency Management director Keith Kesler. "We've done some plume modeling with the wind and stuff. That's what was used to develop the evacuation zone that we have in place in the event that the tank ruptures." Kesler, who arrived at the scene around 10:30 a.m. Thursday, said the tank contains hydrofluoric acid. Paine said early Thursday evening that he believed the biggest risk at the time was an unsafe or disorderly evacuation. "We want to move people to Duluth, to the (Duluth Entertainment Convention Center) right now, which is our main evacuation site, as quickly and safely as possible," said Paine, adding, "When in doubt, get out." Earlier in the evening, Paine said the entire city of 27,000 could potentially be evacuated. The city was coordinating a response to put up residents with the Red Cross and city of Duluth. Gov. Scott Walker was scheduled to come to Superior and state officials are on standby for any resources that may be needed, Paine said. Liebaert said the emergency declaration was a precautionary measure. "We're in no danger at this time," he said. In a press release, Husky Energy said, "all workers have been accounted for." "Husky’s first priority is the safety of its people, the community and emergency responders," the statement read. "There are injuries, which are being treated at hospital and on site. Regulatory authorities have been notified. Local air quality is being monitored." By 6 p.m., fire crews had pulled back and were staying in a defensive mode, fire officials said. In the early evening, Battalion Chief Gordon said they weren't fighting the fire aggressively because they were waiting for enough resources to put it out completely. "Until we have determined we can do that with positive success, we're not going to do that, we're going to stay defensive," Gordon said. "Right now, there are crews on the ground, keeping everything cool, trying to make sure the fire doesn't get any bigger, spread to anything else." Firefighters were within a couple hundred feet of the fire, Gordon said, and water was coming in from the sides to cool the tanks. Gordon said they were working with Duluth firefighters and they had called in outside agencies and specialists in industrial firefighting, specifically from Texas. Gordon said it's possible the fire could take days to put out and that they're putting together a list of personnel and equipment of what they need to fight the fire. 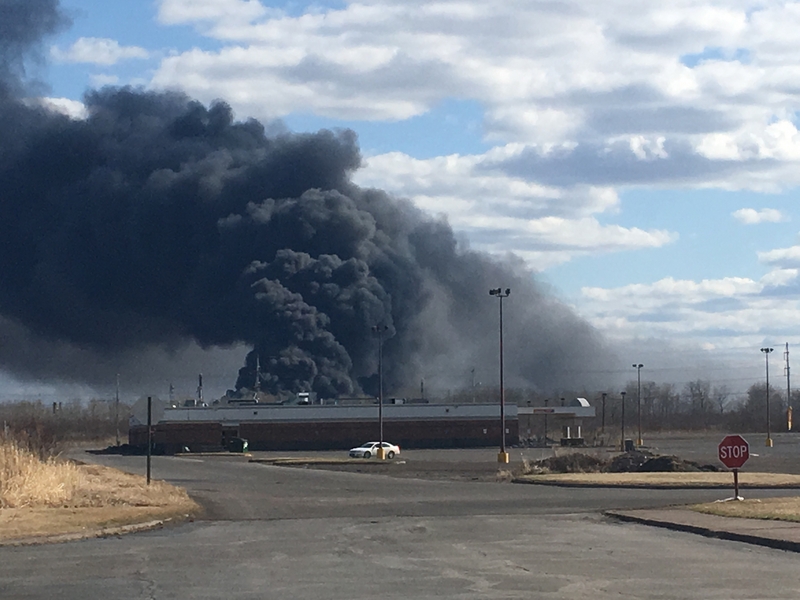 Superior Police Chief Nick Alexander said his department initially received a report of a fire at the refinery at around 10:05 a.m. Thursday. "Typically, fires that have the potential to be a larger scale, which something involving a refinery where there's combustible materials and so on, we basically respond to assist the fire department and control access to the area, make sure that we're stopping people from going into potentially an unsafe area," Alexander said. Jeff Johnson, of Poplar, was working at Petro Choice in Superior, which is down the street from the refinery. Johnson described the sound of the first fire as being like a massive object crashing into the building. "I was inside our warehouse. There was a big explosion and at that point I don’t know what happened," said Johnson. "I went down in the office, looked outside, looked towards Husky and just seen lot of black smoke, and we just started evacuating and went over to the Mariner Mall." People nearby the refinery reported hearing and feeling the explosion. Owned by Alberta-based Husky Energy, Wisconsin's only refinery produces gasoline, asphalt and other products. Editor's Note: This story was originally posted at 10:30 a.m. on Thursday, April 26, 2018. Danielle Kaeding, Andrea Anderson, John K. Wilson, Olivia Shalaby and David Hyland contributed to this report.